Ed O'Neill (Al Bundy in Married With Children) is back on the idiot box in a show about, you guessed it, the modern family. 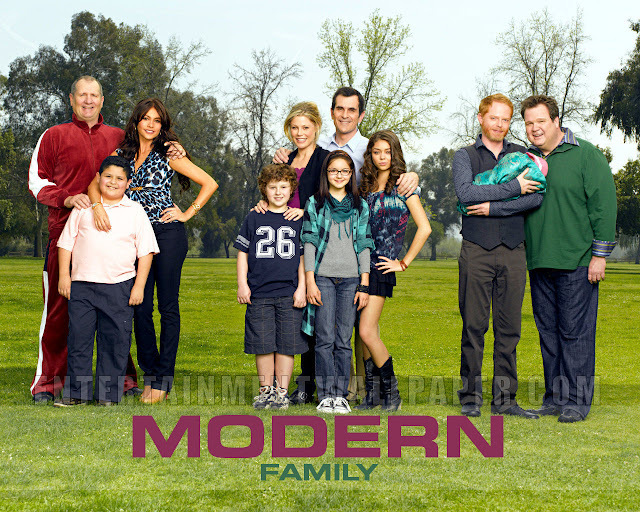 Jay Pritchett (O'Neill) has a modern family consisting of a young Columbian wife Gloria (Vergara), her son Manny, his daughter's family of 5, his gay son Mitchell (Ferguson), his gay son's partner Cameron (Stonestreet) and their adopted Asian baby. I think this show is the surprise packet of 2010. I mean, no way I figured it would be four star material. It's even tipped to win the Emmy this year for best comedy series knocking off 30 Rock which has held the crown for 3 years. I tuned in to check out my man Bundy but was blown out of the water from the hilarity of this show. What works so well for this show is that Modern Family doesn't really have any weak links in its cast and has three insanely funny characters that could carry the show even if everyone else sucked. Manny (Jay's step son), is brilliant in the same way as the kid from Two And A Half Men except he's really smart instead of really dumb. Jay's son-in-law Phil (Burrell) is a sort of Ross from Friends character as the goofy idiot except he's 10 times funnier and isn't anywhere as annoying as Ross is. Then there is Mitchell's partner Cameron. He's my favourite character in the show and is absolutely brilliant as the self-confessed queen. You can't help but laugh at everything he does. This is one of the few shows I laugh out loud to as opposed to grunting through the nose. I hope season 2 is just as good. This is my favorite show at the moment, it's genius. Just finished up watching the season - classic stuff. Phil is such a champ.